At first sight, high oil prices appear to be a boon for Canada. Oil production on the East Coast and on the western prairies is in full gear. Billions of dollars are invested in the tar sands of Alberta, a vast oil reserve that is difficult to exploit. Alberta is booming, cash is rolling in, and the province has annual growth figures that are about four times as high as the healthy Canadian average of about 3 per cent. Still, Canadian economists are concerned. Because just as a barrel of crude oil becomes more expensive, so does the Canadian dollar. The currency, known as the loonie, has gained almost 4 per cent so far this year against the U.S. dollar (to 85 cents U.S.) and 14 per cent against the euro (to 71 eurocents). That’s beginning to cause problems for other sectors of the Canadian economy, particularly industrial production for the export market. In addition to rising energy costs, Canadian makers of car parts, textiles and other products have to deal with the fact that their products are becoming more expensive for foreign buyers. Economists have a name for this phenomenon: Dutch disease. It refers to the situation in the Netherlands in the 1970s, when North Sea oil produced healthy revenues, but the guilder became unaffordable for foreign buyers of other Dutch products. As a result, the discovery of oil was not the blessing it initially appeared to be. 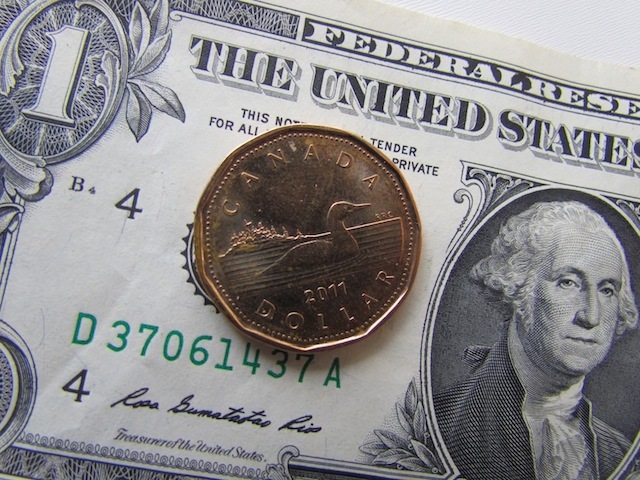 The U.S. dollar and the Canadian currency, nicknamed the ‘loonie’. The exchange rate of the Canadian dollar against the U.S. dollar matters most. The great majority of Canadian exports – 85 per cent – goes to the United States. Since the second half of the 1990s, Canadian exporters have been able to rely on a cheap Canadian dollar, which for a few years floated around the 65-cent mark. The Canadian economy has seen fairly strong growth rates for many years, often even outpacing the U.S. But now that the value of the dollar stands at 85 cents, manufacturers “see their competitive position erode,” says Lovely. Extraction of bitumen from the oil sands in Alberta. This regional imbalance presents a challenge to the central bank. According to the Bank of Canada, the Canadian economy is almost at full capacity. Stimulated by a boom in the domestic construction sector and other domestic consumption, unemployment is low (about 7 per cent). The bank fears inflation, driven by high oil prices, and has started a series of interest rate hikes. Last month, the key lending rate was raised for the second consecutive month by 0.25 percentage points, to 3 per cent. Further hikes are expected.